Almost two years after the attack, Charlottesville police are seeking help in identifying two men in the parking garage beating of DeAndre Harris. Four men have already been arrested and convicted in the Aug. 12, 2017 videotaped beating of DeAndre Harris, in a Charlottesville, Virginia, parking garage, after the white nationalist rally — but police remain unable to identify two attackers. The assault on the then-20-year-old black man, in which he was kicked, punched and hit with flagpoles and wooden planks, has led to convictions of four white nationalists. Daniel Borden, Jacob Scott Goodwin, Alex Michael Ramos and Tyler Watkins Davis have all been found guilty to malicious wounding. The first person of interest is a white man with a red beard, wearing a trucker’s hat. The second is a white man with brown hair, wearing sunglasses. Journalist and activist Shaun King’s online campaign to identify participants in Harris’s attack led to the identification of three of the men arrested thus far. Here you will see the man we are searching for viciously strike DeAndre Harris with a flagpole across his face/head. Tan pants, white shirt, sunglasses, dirty blonde hair. 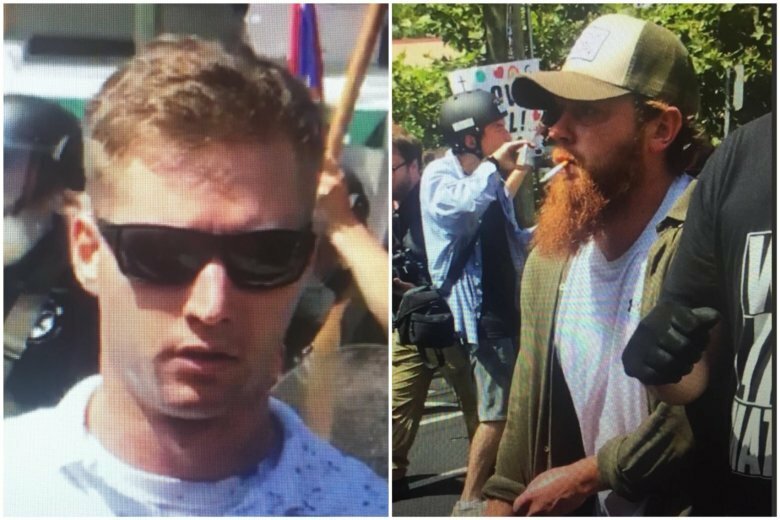 Charlottesville police ask anyone with information on these men to call Crime Stoppers anonymously at 434-977-4000.